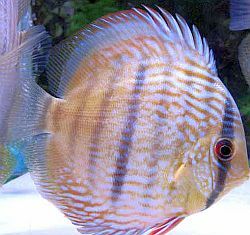 When talking about the health of the discus fish, there are really only two main aspects where great concern should be focused on. These two will dictate highly whether your discus fish will be able to spawn or let alone be healthy and live a long life. These two is the water where they live in and the food they ingest. Another minor aspect that should also be kept in mind prior to owning a discus fish is the tank mates that your discus fish will have. Generally, it is recommended that the discus fish should be the largest fish in the tank. It has always been said that prevention is better than cure, so knowing what signs to look out for to determine whether there is something wrong with the tank or with your discus fish. To be honest, it’s much more bothersome to be treating illness rather than just plainly keeping a routine of maintaining a clean tank, at least you can put it in your schedule. Besides, keeping your tank water clean is just one of the responsibilities of owning an aquarium. Imagine, what would life be if we don’t have air to breathe? Water is air to the discus fish. If your breathing in thick smog all the time then it’s a certainty that you would get sick, maybe develop cancer, or even choke to death in an instant. So, in maintaining the water of your tank, you not only need to keep it clean, but you also have to get the right pH levels and the proper temperature which will simulate the waters where the discus fish came from, which is the Amazon river. Changing the water in your tank should be done at least once or twice a week. A partial change will also be good and it will require less handling of your fish. Changing at least a quarter to half the water in the tank will suffice as long as you have a good biological filtration system installed. In some cases, some aquarists would just add some medication to clear up the dirt. This though should not be done often. As for their food, you should ask the store clerk what food they have been accustomed to. Discus fish can be picky so you need to ensure that you can, maintain the food that they usually eat. Make sure though to never overfeed your fish. The extra food will just become dirt inside the tank. For younger discus fish, you should feed them about four times daily, older fish only needs to be fed twice a day. Growing fishes need the food more. Discus fish should also be fed live or frozen food from time to time. As they re carnivorous, this will add protein to their diet, protein they need to stay healthy. Usually, they would prefer bloodworms or shrimp brine. To help keep the tank clean, always clean your tank two hours after you have fed them, remove the excess food right way.